The Flyfisher Online, known as the Compleat Flyfisher for more than 40 years, has been Australia’s source of quality brand name fly fishing gear and expert advice. To evolve into the modern era, we’ve simplified our name to The Flyfisher and built Australia’s best fly fishing web site. We pride ourselves on offering you, the customer, the best in service and provide you with the worlds best fly fishing gear. If we don’t sell it there’s probably a valid reason why. If you can’t find what you’re after here, we’ll jump through hoops to get it for you. Our inner-city fly shop is world class and unlike any other fly shop in Australia. You’ll find everything you’re after and a whole lot more. Our staff fly fish extensively and are up-to-date with what’s happening in your local area and they have the knowledge to help you plan a successful trip locally or abroad. In time, this will become the address for all your fly fishing needs. Enjoy looking around the site and we hope you’ll visit our Melbourne city store and say hello. At this stage, not all our products have been uploaded to the site, so keep checking back regularly. For unbiased information on products or anything fly fishing related, please pick up the phone and call us or drop into the store. Believe it or not, talking fishing with you is the best part of our day! Stu’s Superior Fly designs for freshwater, saltwater, warm water fish species are all unique designs – tied with durable materials on Tiemco specialist fly hooks. Making these flies at this quality obviously is more costly, but the results are the best durable fish catching fishing flies you can buy. Stu’s Superior Flies are ultimate in design, performance and durability – which result in you catching more fish, having more time fishing and not loosing the big one. Volume is an award winning Melbourne based independent full service digital agency. The Design Team at HCE deliver you fly rods of exquisite quality and performance to enhance your fly fishing experience. High performance fly rods built by us right here in Melbourne Australia; quality assurance is guaranteed. HCE Tuned Fly Rod Range. SAGE Authorised Rod Building Partner and Dealer. Australian Agent for CTS Fly Rod Blanks. Authorised Dealer for REC Fly Rod Components. Authorised Dealer for Snake Brand Fly Rod Components. Should you have any questions, feel free to contact us at any time. From beginners to experts, Wilderness Fly Fishing offers guiding for all levels to some awesome locations. Located less than two hours drive from the Melbourne CBD and 90 minutes from the eastern suburbs, GVFFC is situated on the Goulburn and Rubicon Rivers in the town of Thornton; a 10 minute drive from both Alexandra and Eildon. 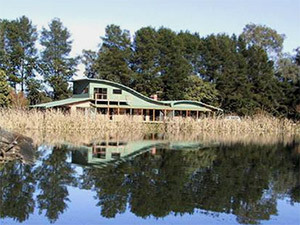 • Accommodation: self-contained cottage accommodation on private lakes with access to the Goulburn River. • Instruction: for fly fishers of all levels beginner to advanced. • Guiding: fishing either on the bank or from our drift boats with a guide. • Guided destination trips: New Zealand, Swampy Plains, Mitta Mitta and Tumut. • Hosted overseas trips: Montana, British Columbia, Los Roques and other destinations. • Retail sales: bricks and mortar store and online sales of fly fishing gear.